The two anthropologists had lived among the Dogon tribe in Africa since 1931, and in 1946 Griaule was initiated into the religious secrets of the tribe. He was told that fishlike creatures called the Nommo had come to Earth from Sirius to civilizes its people. Sirius B, which the Dogon call po tolo (naming it after the seed that forms the staple part of their diet, and whose botanical name is Digitaria), is made of matter heavier than any on earth and moves in an elliptical orbits, taking fifty years to do so. It was not until 1928 that Sir Arthur Eddington postulated the theory of "white dwarfs" - stars whose atoms have collapsed inward, so that a piece the size of a pea could weigh half a ton. (Sirius B is the size of the earth yet weighs as much as the sun.) Griaule ad Dieterlen went to live among the Dogon three years later. Is it likely that some traveler carried a new and complex scientific theory to a remote African tribe in the three years between 1928 and 1931? An oriental scholar named Robert Temple went to Paris to study the Dogon with Germaine Dieterlen. He soon concluded that the knowledge shown by the Dogon could not be explained away as coincidence or "diffusion" (knowledge passed on through contact with other people.) 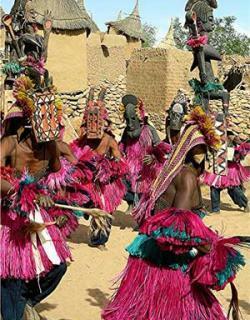 The Dogon appeared to have an extraordinarily detailed knowledge of our solar system. They said that the moon was "dry and dead", and they drew Saturn with a ring around it (which, of course, is only visible through a telescope). They knew that the planets revolved around the sun. They knew about the moons of Jupiter (first seen through a telescope by Galileo). They had recorded the movements of Venus in their temples. They knew that the Earth rotates and that the number of stars is infinite. And when they drew the elliptical orbits of Sirius, they showed the star off-center, not in the middle of the orbit - as someone without knowledge of astronomy would naturally conclude. The Dogon insisted that their knowledge was brought to them by the amphibious Nommo from a "star" (presumable they mean a planet) which, like Sirius B, rotates around Sirius and whose weight is only a quarter of Sirius B's. They worshipped the Nommo as gods. They drew diagrams to portray the spinning of the craft in which theses creatures landed and were precise about the landing location - the place to the northwest of the Dogon country, where they were originated. They mentioned that the "ark" in which the Nommo arrived caused a whirling dust storm and that it "skidded". They speak of "a flame that went out as they touched the earth", which implies that they landed in a small capsule. Dogon mythology also mentions a glowing object in the sky like a star, presumably the mother ship. Our telescope has not yet revealed the "planet" of the Nommo, but that is hardly surprising. Sirius B was only discovered because its weight caused perturbations in the orbits of Sirius. The Dog Star is 35.5 times as bright (and hot) as our sun, so any planet capable of supporting life would have to be in the far reaches of its solar system and would almost certainly be invisible to telescopes. Temple surmises that the planet of Nommo would be hot and steamy and that this probably explains why intelligent life evolved in its seas, which would be cooler. These fish-people would spend much of their time on land but close to the water; they would need a layer of water on their skins to be comfortable, and if their skins dried, it would be as agonizing as severe sunburn. Temple sees them as a kind of dolphin. But what ere such creatures doing in the middle of the desert, near Timbuktu? In fact, the idea is obviously absurd. Temple points out that to the northwest of Mali lies Egypt, and for many reasons, he is inclined to believe that the landing of the Nommo took place there. Temple also points out that a Babylonian historian named Berossus - a contemporary and apparently an acquaintance of Aristotle (fourth century BC)-claims in his history, of which only fragments survive, that Babylonian civilization was found by alien amphibians, the chief of whom is called Oanned - the Philistines knew him as Dogon (and the science-fiction writer H.P. Lovecraft borrowed him for his own mythology). The Greek grammarian Apollodorous (about 140 BC) had apparently read more of Berossus, for he criticizes another Greeek writer, Abydenus, for failing to mention that Oannes was only one of the "fish-people"; he calls these aliens "Annedoti" ("repulsive ones") and says they are "semi-demons" from the sea. But why should the Dogon pay any particular attention to Sirius, even though it was on of the brightest stars in the sky? After all, it was merely one among thousands of stars. There, at least, the skeptics can produce a convincing answer. Presumably, the Dogon learned from the Egyptians, and for the ancient Egyptians, Sothis (as they called Sirius) was the most important star in the heavens-at least. after 3200BC, when it began to rise just before the dawn, at the beginning of the Egyptians New Year, and signaled that the Nile was about to rise. So the Dog Star became the god of rising waters. The goddess Sothis was identified with Isis; and Temple points out that in Egyptian tomb painting, Isis is usually to be found in a boat with two fellow goddesses, Anukis and Satis. Temple argues convincingly that this indicates that the Egyptian knew Sirius to be a three-star system - the unknown "Sirius C" being the home of the Nommo. An ancient Arabic name for one of the stars in the Sirius constellation (not Sirius itself) is Al Wazn, meaning "weight" and one text says that it is almost too heavy to rise over the horizon. Temple suggests that the ancients may have looked toward the Canis constellation for Sirius B and mistaken it for Al Wazn. He also suggests that Homer's Sirens-mermaid like creatures who are all-knowing and who try to lure men away from their everyday responsibilities actually "Sirians", amphibious goddesses. He also points out that Jason's boat, the Argo, is associated with the goddess Isis and that it has fifty rowers-fifty being the number of years it takes Sirius B to circle Sirius A. There are many other fish-bodied aliens in Greek mythology, including the Telchines of Rhodes, who were supposed to have come from the sea and have introduced men to various arts, including metal work. Significantly, they had dogs' heads.